John Harold Force was born on the 4th May 1949 in Bell Gardens, California USA. He has earned his fame through a successful career as a drag racer, winning NHRA on 16 occasions, the last one being in 2013, and having 143 victories on the track. His career has been active since 1978, and he is still representation in drag racing through his daughters, Ashley Force Hood and Britany Force, who are racing for his team “John Force Racing”. Have you ever wondered how rich John Force is? 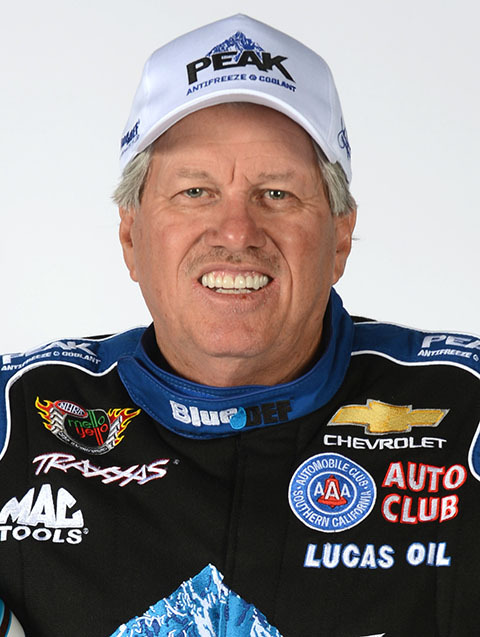 According to sources it is estimated that John Force`s total net worth is $12 million, an amount earned through his successful racing career, during which John has also been rewarded numerous times, such as Driver of the Year in 1996 and Most consecutive championship seasons- 10, from 1993-2002. John`s childhood is not something to talk about, as he grew up in Indian reservations, trailer parks, and had to move a lot. He had five siblings, however, his older brother Tom died. Before he laid his hands upon the wheel, John was educated at Bell Gardens High School, following which he enrolled at Cerritos College on a football scholarship, however, he dropped out in order to pursue his career as a drag racer. John began racing as early as 1978 when he found his own team John Force Racing. His first car was a Corvette, but later in the 1980s he changed it for Oldsmobile Cutlass and drove it until the 1993 season end. In the next few years he changed cars from Pontiac to Ford in 1997, and raced it ever since. His first years in NHRA were not very successful, finishing close to the bottom, and one time finishing fifth. However, in 1986 Castrol Motor Oil had become his main sponsor, and his results improved. Under their sponsorship he won his first championship, in 1990. Ever since then, John has been dominating on the tracks, winning ten consecutive titles from 1993 to 2002. These events earned him nationwide fame, and certainly increased his net worth, plus because of his dominance he also acquired his nickname, “Brute Force”. Other than his championships, John`s net worth benefited mostly through the bonuses and prizes for his 143 career wins on the race tracks. His next few years were not as great, however he managed to win his 16th championship in 2013. Over the years, as his net worth grew, he managed to include more cars and drivers into his team which also increased his net worth with their own success and popularity. Currently, his team is his family, as the drivers include his two daughters Britany and Ashley and his son-in-law Robert Hight, who also won a NHRA championship for the team in 2009. It was officially confirmed that the John would compete in the 2015 season. Addition to John`s net worth, he was also a co-founder of the restaurant chain found all over the USA, “Race-Rock” with fellow racers, Jeff Gordon, Richard Petty and Michael Andretti. Overall, his career as a drag racer, which has lasted for more than 35 years, has been quite successful; he is ranked the 2nd overall NHRA driver, behind Don Garlits, and in 2012 he received the Lee Lacocca Award. Regarding his personal life, John has been dedicated to racing, but since 1982 he has been married to Lana Force, with whom he has three daughters, who are part of his team. However, John has one more child from his first marriage, daughter, Adria Hight, who is a CFO of the Force Racing team. 1 Father-in-law of Daniel Hood. 2 Father, with Laurie Force, of daughters Ashley Force, Brittany Force and Courtney Force. 3 Co-owner, with fellow racers Jeff Gordon, Richard Petty and Michael Andretti, of "Race Rock", a chain of race-themed restaurants.